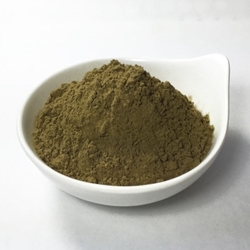 This 50x Maeng Da Kratom Extract stands apart from the other powdered Kratom extracts available on our site. It's the newest and most concentrated extract we offer, and it's made exclusively in small batches in a beyond-food-grade standards manufacturing facility in the USA. This premium quality Kratom is only available in very small quantities, and is always a Top Seller here at Shaman's Garden whenever it's in stock. Nothing in the marketplace is of higher quality, and the best part about our in-house extracts, is that there's no hype, just quality. Since we make this product week after week, and then get it tested every single time a batch is completed. We provide Certificates of Analysis for all of our Kratom products upon request, to show they are certified free of pathogens and dangerous levels of heavy metals. Since we make this product week after week, and then get it tested every single time a batch is completed at Wonderland-Labs, we couldn't be more proud of the strength and purity of this exotic botanical called Maeng da 50x Powdered Extract. This is one of the Top Three sellers here at the shop, with Maeng Da 35x tied for second place with the Bali 20x. This is also a very fine powder; it's not resiny or clumpy in any way. This 25x Maeng da powdered Kratom extract is a free flowing material that is extracted using only ethanol and purified water. We provide Certificates of Analysis for all of our Kratom products upon request, to show they are certified free of pathogens and dangerous levels of heavy metals.